The HES-S2 Ergo Steel-Stainless is a fast and easy way to straighten and restore those knife edges for razor-sharp performance. It is an edge maintenance tool used on the production floor. Throughout the day, as a knife edge dulls, the operator can slide the blade through the unique spring-tensioned rods of the Ergo Steel HES-S2 and straighten the edge in a matter of seconds. The smooth electropolished finish of the Ergo Steel-Stainless reduces product adhesion and contamination build up and allows for more thorough, easier cleaning. 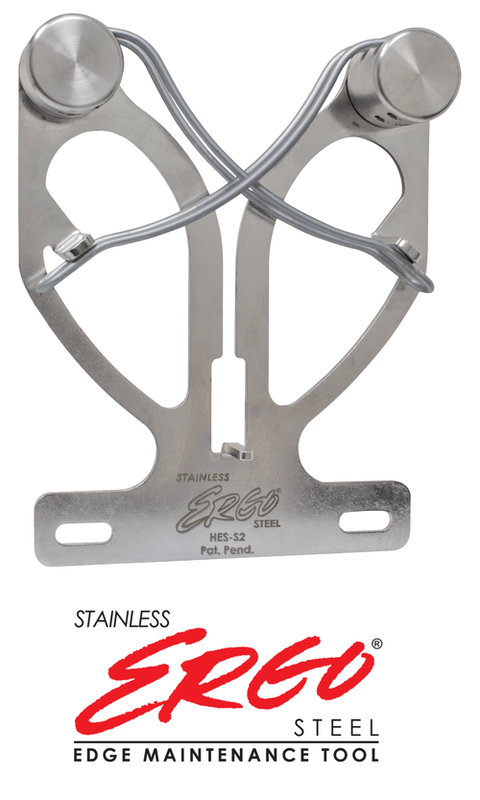 Requires virtually no training to use, the Ergo Steel-Stainless can be used comfortably and safely, right-or left-handed. • All Stainless steel design for improved hygiene and durability. • Electropolished finish reduces product adhesion and contamination build up. • Compact, open design to reduce surface area. • Wide knife entrance easily guides the blade to the 4 alignment rods for a perfect edge in seconds. • Specially developed flexible stainless steel alignment rods provide superior durability for straightening knife edges. • Aligns both sides of the blade simultaneously. • Straightens and prolongs the edge life of knives. • Ideal for knives of any length. 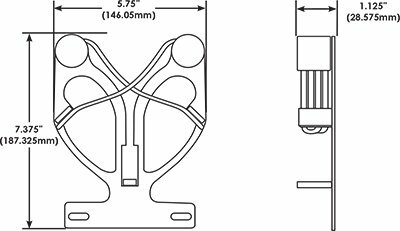 The HES-S2 consists of a pair of pivoting, specially developed flexible stainless steel alignment rods on a compact, open design, electropolished base. Under each pivoting rod, spring mechanisms provide the perfect amount of tension between the knife edge and stainless steel rods. Both sides of the edge are straightened simultaneously, assuring a perfect edge in seconds. Stainless steel is corrosion and rust resistant. Proper cleaning and sanitizing procedures must be followed to maintain the integrity of the HES-S2. The choice of cleaning method and the frequency of its application depends on the nature of the process, the product being processed, the deposits formed and hygiene requirements. Chemical disinfectants are often more corrosive than cleaning agents and care must be exercised in their use. Due to the variety of chemical disinfecting agents available, we strongly recommend an evaluation be performed to determine the effect of your cleaning agent, used at normal concentrations, on the stainless steel.